Kayaks are built with thin material to perform on the water optimally. During storage warping can occur because the material is stretched very thin. When storing a kayak, it's crucial to keep three factors that can cause harm in mind: time, heat, and stress. The kayak should be properly balanced and covered. To safely store your kayak, make sure it is kept either at an angle or standing up. 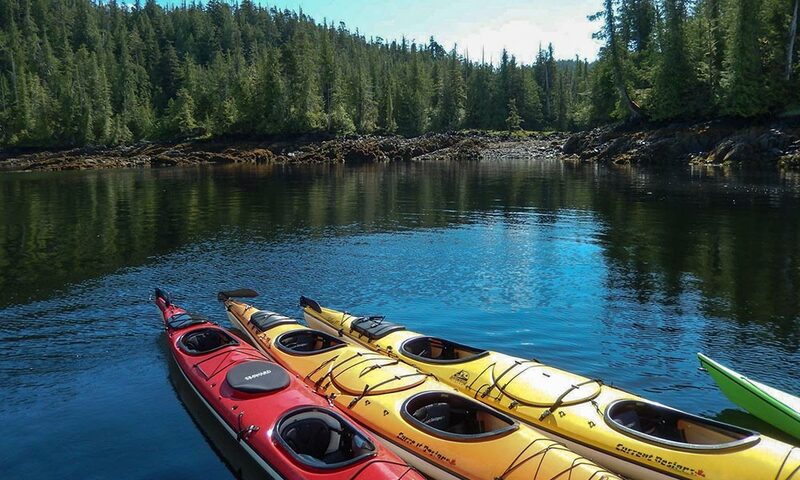 Decide on a place where to store your kayak. The area needs to be sufficiently large. Measure your kayak and your storage space in advance to make sure your kayak will fit. Kayaks take up a lot of space and should not be in contact with other items when being stored. Ideally, it should be stored indoors where it is protected. 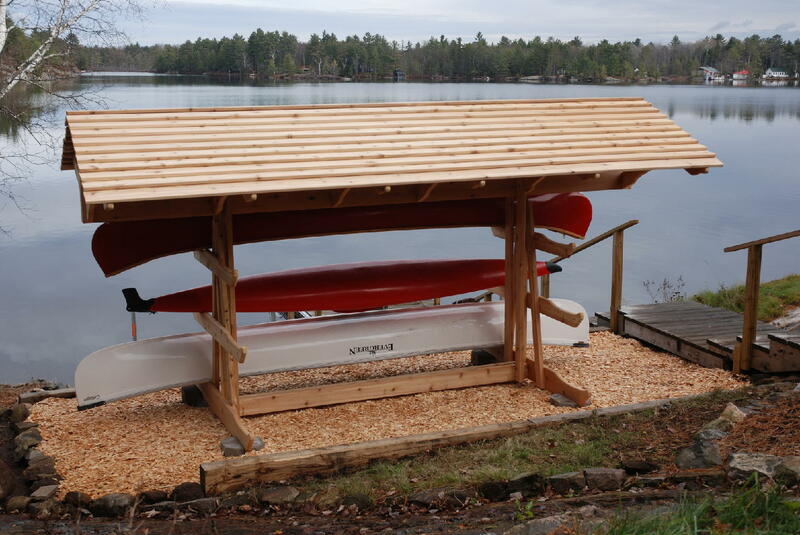 You could store your kayak in a garage, shed, basement, or any other indoor storage area. If you don’t have enough space and need to store it for a long period of time, you can turn to a marina, kayak school, kayak rental or paddling club – these offer kayak storage sometimes. Control the temperature of the storage area. The temperature should not be below freezing or above 38 degrees Celsius (100 F). This is important – the kayak will sustain damage or become brittle. Never store it in direct sunlight because the heat will warp the plastic. 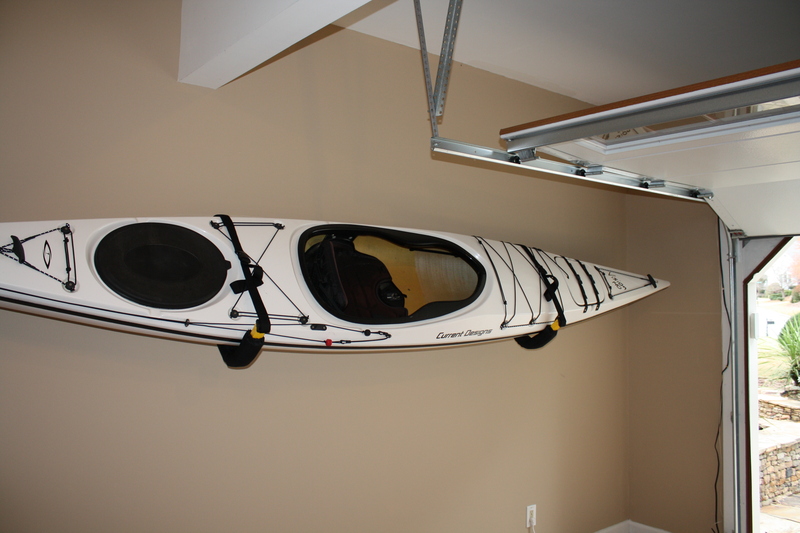 If you are planning on storing the kayak in your garage, it should be in a dark area away from direct heat sources. Wash out your kayak. Use a sponge and a mild all-purpose cleaner to wipe it down, and make sure you clean it both inside and out. There should be no remaining residue or dirt. Rinse thoroughly with water after cleaning to make sure no soap remains on it. Albeit intended for use in water, kayaks are not made to be wet all the time. Water will begin to ruin the kayak’s surface. Mildew and mold will grow if it is covered and there is moisture inside. Wipe it dry with a towel and remove any water from its hatch or drain plug. Remove soft materials if you will store it outside. The seat should be removed, as should any fabric or other soft materials. Store soft materials in a warm and dry place, like your closet. You can purchase a special kayak cover, use a simple tarp or use a cover for the cockpit. This will protect the kayak from dust in a garage or other covered area or from the elements if stored outside. If you are using a tarp, we recommend creating space between the tarp and the kayak so that water or snow will not build up on top of it and no moisture remains inside. Tie a rope a few feet off the ground in between two poles or trees to use the tarp like a tent. Drape the tarp over the rope and place the kayak underneath. First, find a level surface so that the kayak will balance evenly. Ideally, it should lean against a wall. Place it horizontally on its side. Tilt it with its cockpit facing away from the wall. It should rest against the wall at an angle. It won’t dent unless you plan to store it for an entire season. If that’s the case, flip it onto its other side once every few weeks. To protect your kayak, put some padding underneath it. You could place a few cushions or towels inside a small crate and place the end of the kayak inside. Install a couple of support pegs on the outer edge of each side to hold it in place. Don’t store the kayak flat over long periods of time. This puts excessive stress on it. Never hang a kayak from drywall or plywood - find a sturdy structure. You need strong metal pipes or a sturdy wood beam that will support it. Choosing a good location to hang it from is important to make sure the kayak and the wall are safe. Most wall mounting storage systems require installation in the studs of the wall. Get a bracket-style or rope storage system. With a rope system, you attach the ropes to the wall and wrap them around your kayak. If using a bracket system, the kayak is supported on top of the brackets, which are installed into the wall. The latter system is more expensive. 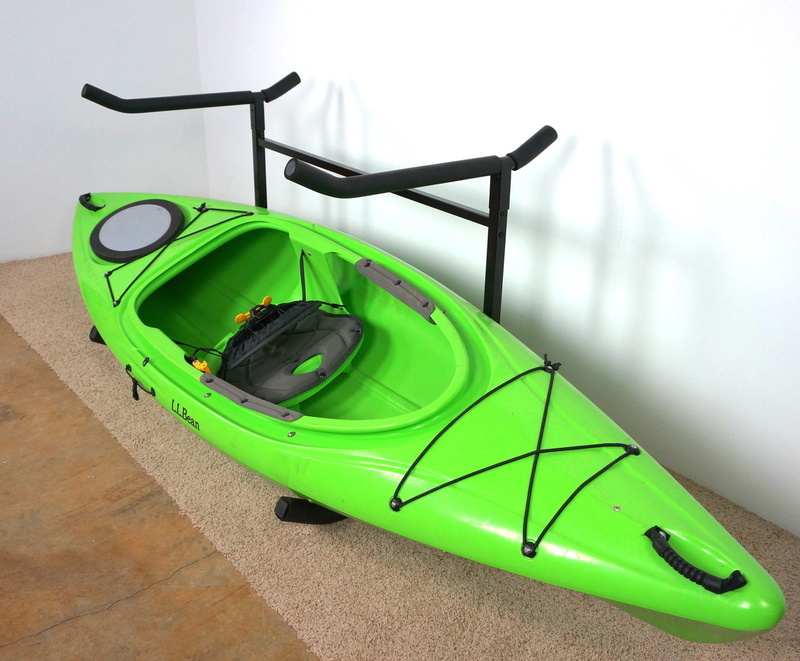 A storage rack with brackets supporting the kayak costs around $100. The brackets are mounted on a wall. They securely support your kayak and can be folded when not in use. 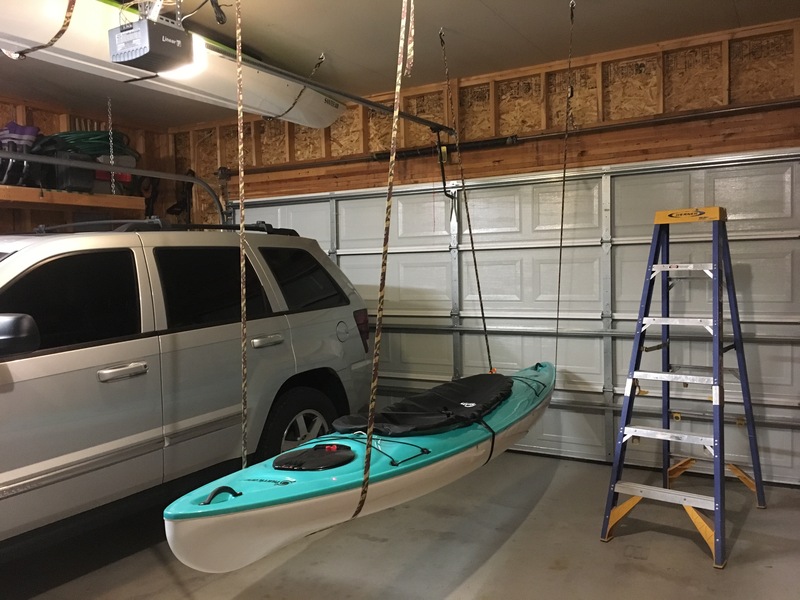 You can buy a kayak hanger – it is very easy to install. It works by attaching ropes to the wall with hooks, which go around your kayak to hold it in place. You can build a hanger if you already have strong ropes. To attach the storage rack, you must find the studs of your wall and then drill holes into their centers. Attach them one at a time, ensuring yourself they are completely level. First attach the top of the post, then the bottom. The distance between the posts should be at least the diameter of the kayak’s cockpit. To attach the kayak hanger, you need to find wall studs or ceiling rafters. After this, drill a hole for the eye bolts. Screw in the eye bolts by twisting them into the hole you drilled and insert a hook into each eye bolt. The rope is then wrapped around the kayak. Make sure your kayak is properly balanced. This is done by making sure the brackets or straps are at an equal distance from each end of the kayak. It should be fairly centered if you place them just outside of the cockpit, but you can adjust the kayak’s position so that it is perfectly level. Don’t hang the kayak by its handles. It may seem like a good idea, but the carrying handles on the ends are the weakest points. Like we mentioned earlier, it’s very easy to build a rack. Buy 10 feet (3 m) of 1-inch (2.54 cm) PVC pipe, and 4 PVC joints, along with 3 1-inch PVC mounting clamps. With these pipes you can build a 1 ft (0.3 m) by 4 ft (1.2 m) rectangular frame to fix the kayak securely against a wall. You have to cut the PVC pipe using a saw and connect the frame by the joints. Saw two pieces that are 4 ft (1.2 m) long and two pieces that are 1 ft (.3 m) long. Attach them by gluing the pieces together in the joints using all-purpose PVC glue. Before fixing the frame to the wall, allow the joints to dry fully. Now, affix the PVC frame to a wall. Place it around 5 feet (1.52m) from the ground with mounting clamps on a wall in your storage area. Screw the clamps into the studs of the wall in a straight line. One clamp should be screwed in on each stud (you need 3 clamps for a 4 ft. frame, equally spaced out). Clip each clamp on the same side of the frame. This will hold it attached to the wall, securely in place. Install it lower or higher depending on the size of your kayak. Place your kayak vertically into the frame. That's it for our tips on how to store a kayak! ​Leave a comment below with any questions.